The tufahija dessert, which is made and served as a single portion originates from Persia (tuffah -apple) and the Turks brought it to the Balkans during the Ottoman Empire rule. 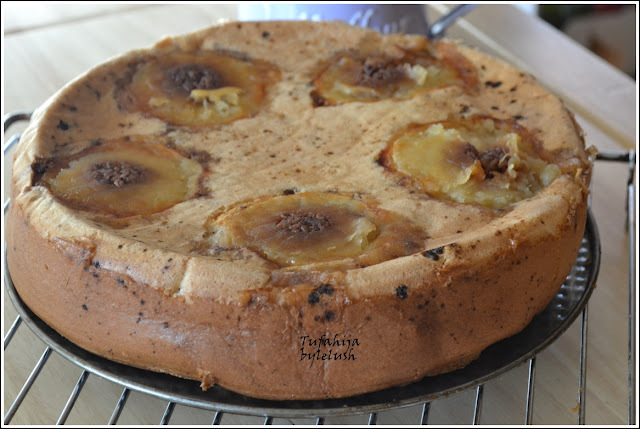 This torte is a modernised version of a centuries old eastern recipe. Peel and core the apples with a spoon or melon baller if you don't have an apple corer. Mix the nuts and sugar and put the mixture tightly into the cored apples. You will probably have a little bit to spare. Lay a round 28 cm baking dish with parchment paper and arrange the apples into a circle. Bake in the preheated oven 200 C. Take them out when they are half baked. It takes around 20 to 30 minutes for most apple varieties to get softer, but not thoroughly baked. Let them to cool down a little bit. Don't switch the oven off. Beat 6 egg whites with 6 tablespoons of sugar until stiff, add 6 yolks, one by one, mixing on a lower speed, at the end mix 6 tablespoons of flour mixing by hand. Sprinkle in the nuts and the sugar leftover and pour over the baked apples. Return to the oven and bake until the batter is fully baked. Leave it to cool down and cover with whipped or double cream to serve.